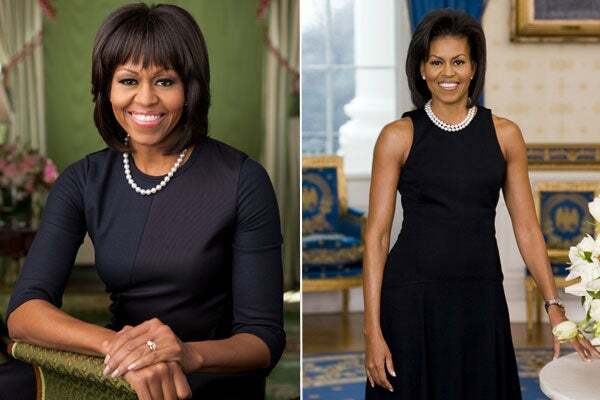 Today, the White House released the second official portrait of First Lady Michelle Obama — and the snapshot is strikingly different than the 2009 version. A few changes are obvious: She's ditched the sleeveless Michael Kors number for a more covered-up, custom frock by her new favorite talent, Reed Krakoff, and the oft-debated bangs are front-and-center. But, what's most striking to us is how much more relaxed and natural the first lady looks in front of the camera four years later — her smile is soft, not forced; her eyebrows are gently curved, not arched; and she's sitting comfortably in the Green Room, not awkwardly touch-leaning on a table in the Blue Room. Whether the change was inspired by the new setting or something more significant — like a sense of accomplishment after four years in one of the toughest jobs around — we're seriously impressed with MObama's new portrait. What do you think?